Conference of European Lawyers in London on Swiss Franc Loans to Consumers 9/9/2015. 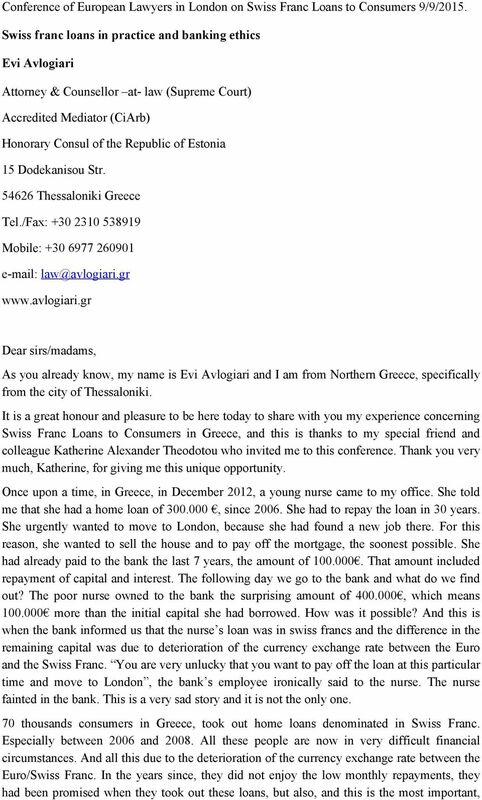 Download "Conference of European Lawyers in London on Swiss Franc Loans to Consumers 9/9/2015." 3 with that of a loan in Swiss Franc. Inevitably consumers trust the bank s recommendation and disregard future risks. That is why it is crucial, in such cases, the bank to provide the whole information about the risks, with the necessary intensity and emphasis. 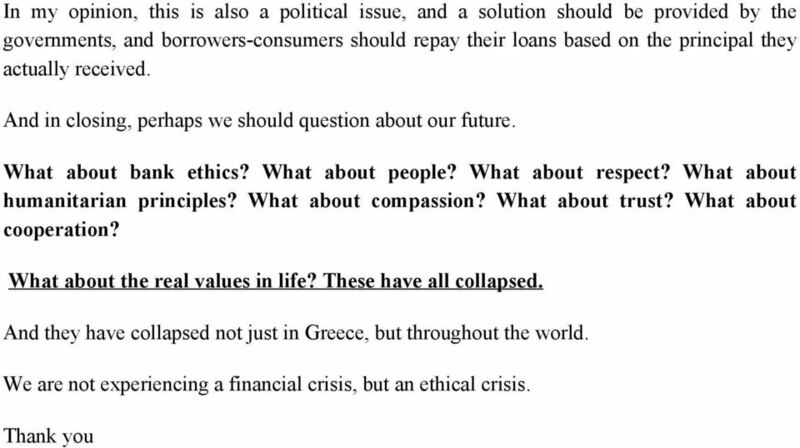 Banks have an obligation, based on good faith and transparency. It is their duty to preserve the balance of loan and repayment. It is their duty to inform, enlighten and counsel their customers. That is why it is the bank s obligation, before granting a fx loan, to inform the borrower of the risks he will face, and also to investigate borrower s ability to understand and deal with these risks. Only once a consumer has received full, clear and correct information, only then, he is capable to make a responsible choice about taking out a fx loan. But, the bank s obligation to inform and enlighten, is not limited, to an abstract or generalized reference to currency exchange risk. It includes many duties. 1.The bank must provide information on the characteristics and knowledge that a customer must possess in order to choose a fx loan; 2. The bank must warn about the risks that may ensue, 3.The bank must give specific examples of a detrimental fluctuation of the currency exchange rate so that the borrower may perceive and understand the dangers; 4. Also the bank must give information: about methods to balance the risk; about unfavourable limitations about consequences from exercising his rights from the loan (e.g. early repayment); about the skill required to monitor currency exchange rates, etc. 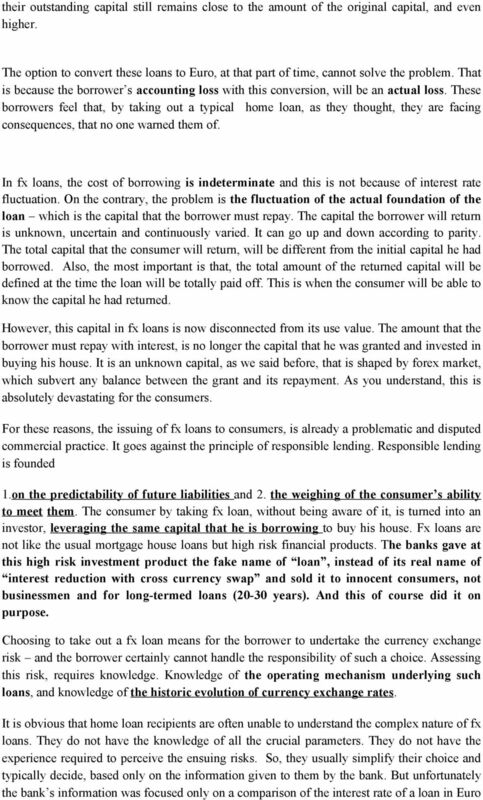 It is easily understood that if the consumers were properly and analytically informed, there would be no logical person willing to accept this type of loan. But why so many people decided to take this type of loan? It was so wonderfully organized by the banks that even the lawyers were tricked because there was no reference to the swap in the contracts. So they didn t know what was really going on. And as if this was not enough in 2010 when the consumers became suspicious because the amount of the monthly installments increased, the bank managers started convincing them (and we have evidence about that) that there was no need to worry because the cost of the loan in swiss francs is still lower than the cost of the loan in euros. The most impressive fast is that in the majority of the greek loan contracts there is no term allowing the consumer to change the currency of the loan. So for 30 year he is imprisoned in the certain contract with no alternative solutions. 5 secure its profit. This is a behaviour contrary to accepted principles of morality and for that reason invalid. C. EMBEDDING OF A DERIVATIVE INTO A FX LOAN AGREEMENTS The bank proceeded to conclude a swap (currency exchange) contract, in addition to the loan agreement. Specific, the bank agreed primarily to a loan agreement which includes loan repayments in Swiss Francs. But the bank added to the borrower s obligation for loan repayment, a derivative agreement. So a fx loan agreement includes two separate agreements, the main agreement for the loan and the second for the swap. That derivative swap agreement, means that every month the consumer will repay, instead of the payable Swiss Francs, their equivalent in Euro. That is, the Swiss Francs owed would be mandatorily exchanged for their equivalent in Euro, at the exchange rate valid at the time of payment due by the borrower. Hence, this agreement affected solely and exclusively the borrower, because he alone had to repay the loan. However, this additional swap agreement does not clearly result from the loan contract. The swap is not covered in any case by the will of the borrowers. 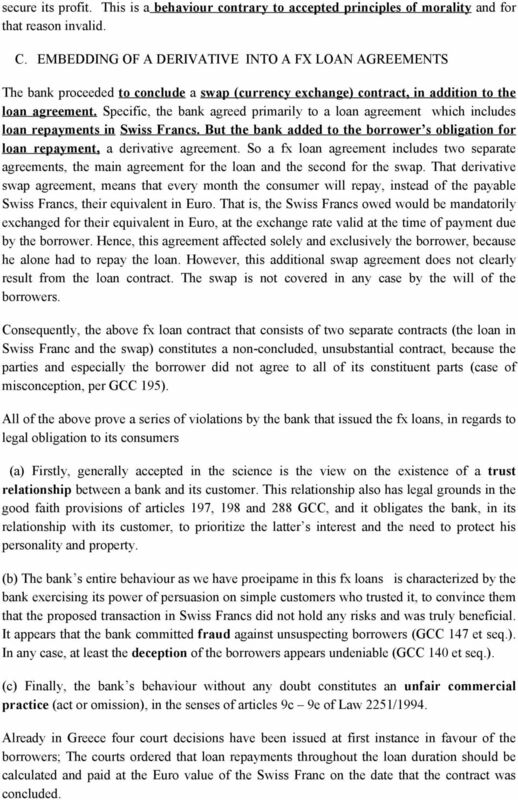 Consequently, the above fx loan contract that consists of two separate contracts (the loan in Swiss Franc and the swap) constitutes a non-concluded, unsubstantial contract, because the parties and especially the borrower did not agree to all of its constituent parts (case of misconception, per GCC 195). 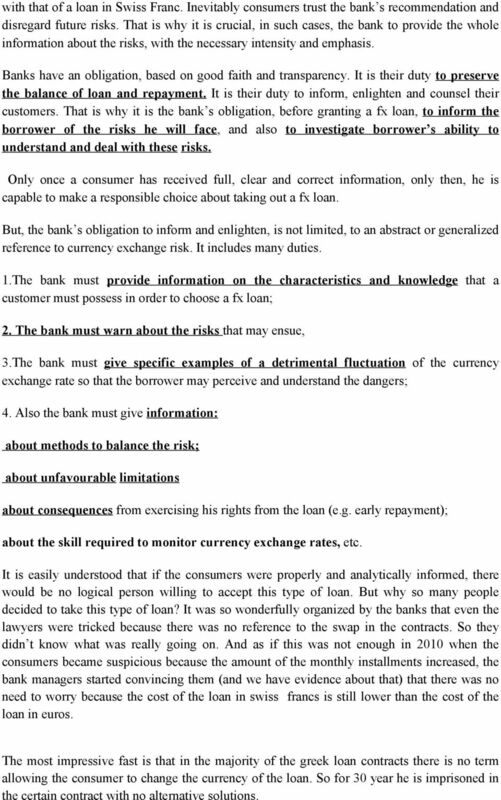 All of the above prove a series of violations by the bank that issued the fx loans, in regards to legal obligation to its consumers (a) Firstly, generally accepted in the science is the view on the existence of a trust relationship between a bank and its customer. This relationship also has legal grounds in the good faith provisions of articles 197, 198 and 288 GCC, and it obligates the bank, in its relationship with its customer, to prioritize the latter s interest and the need to protect his personality and property. (b) The bank s entire behaviour as we have proeipame in this fx loans is characterized by the bank exercising its power of persuasion on simple customers who trusted it, to convince them that the proposed transaction in Swiss Francs did not hold any risks and was truly beneficial. It appears that the bank committed fraud against unsuspecting borrowers (GCC 147 et seq.). In any case, at least the deception of the borrowers appears undeniable (GCC 140 et seq.). (c) Finally, the bank s behaviour without any doubt constitutes an unfair commercial practice (act or omission), in the senses of articles 9c 9e of Law 2251/1994. Already in Greece four court decisions have been issued at first instance in favour of the borrowers; The courts ordered that loan repayments throughout the loan duration should be calculated and paid at the Euro value of the Swiss Franc on the date that the contract was concluded. What will happen to the bankrupt's home? Risk Disclosure. Market swings: swing is a sudden shift in the price of an underlying asset price from one level to another. Regis House, First Floor, 45 King William Street, London EC4R 9AN Tel: +44(0)20 3102 6761 E-mail: acahelp@aca.org.uk Web: www.aca.org. Foreclosure Rescue. You Have Options! Inside: Powerful Strategies to Avoid Foreclosure. Are You at Risk of Losing Your Home in Foreclosure? Monitoring & Managing Effective Compliance Programs BY LYNN FOUNTAIN, CPA, CGMA T here is no understating the importance of the establishment of a solid compliance program within today s business environment.